Spinor groups and algebraic coding theory, J. Combin. Theory, series A, 50 (1989) 277--313. Maximal abelian subgroups of spinor groups and error-correcting codes, in Algebraic Topology, Mark Mahowald, Stewart Priddy, eds., Contemporary Mathematics, vol. 96, 1989, pp. 333--350. Self-orthogonal codes and the topology of the spinor groups, in Coding Theory and Design Theory, Part I, Coding Theory, D. Ray-Chaudhuri, ed., IMA volumes in Mathematics and its Applications, volume 20, Springer-Verlag, New York, 1990, pp. 219--239. Witt's extension theorem for mod four valued quadratic forms, Trans. Amer. Math. Soc., 336 (1993) 445--461. With Harold N. Ward , Characters and the equivalence of codes, J. Combin. Theory, series A, 73 (1996) 348--352. Applications of Finite Frobenius Rings to the Foundations of Algebraic Coding Theory, in the Proceedings of the 44th Symposium on Ring Theory and Representation Theory (Okayama University, Japan, September 25-27, 2011), O. Iyama, ed., Nagoya, Japan, 2012, pp. 223-245 ( pdf ). Lecture notes on the MacWilliams identities and the extension theorem, for the CIMAT International School and Conference on Coding Theory, CIMAT, Guanajuato, Mexico, November 28 - December 4, 2008. Draft version of November 25, 2008 ( pdf ). Lecture notes on the MacWilliams identities and self-dual codes over non-commutative rings, for the Workshop on Coding Theory and Geometry of Rational Surfaces, Instituto de Física y Matemáticas, Universidad Michoacana de San Nicolás de Hidalgo, Morelia, Michoacán, México, September 23 - 26, 2009. Draft version of September 23, 2009 ( pdf ). Ring involutions and self-dual codes. Slides for my talk in the special session on Advances in Algebraic Coding Theory at the AMS sectional meeting in Lexington, Kentucky, March 27, 2010. ( pdf ) Some photos, courtesy of Jon-Lark Kim: 1 , 2 . Lecture series: Two Fundamental Theorems of MacWilliams, Huazhong Normal University, Wuhan, Hubei, China, June-July 2011. Lecture one, June 22, 2011: The classical case over finite fields ( pdf ). Lecture two, June 28, 2011: The MacWilliams identities over finite rings ( pdf ). Lecture three, July 2, 2011: The MacWilliams extension theorem over finite rings ( pdf ). Lecture series for the research school Algebra for Secure and Reliable Communication Modeling, Morelia, Michoacan, Mexico, October 2012. Linear codes over finite rings and modules, October 5, 2012: ( pdf ). Characters and the MacWilliams identities, October 8, 2012: ( pdf ). Characters and finite Frobenius rings, October 9, 2012: ( pdf ). Ring involutions and self-dual codes, October 9, 2012: ( pdf ). Quasi-cyclic codes, October 12, 2012: ( pdf ). Equivalence of codes: sufficient conditions, October 12, 2012: ( pdf ). Equivalence of codes: necessary conditions, October 13, 2012: ( pdf ). Equivalence of codes: general weights, October 13, 2012: ( pdf ). Lecture series (mini-cours), Linear codes from the axiomatic viewpoint, for the conference Noncommutative rings and their applications IV, Lens, France, June 2015. Overview and characters, June 8, 2015: ( pdf ). MacWilliams identities, June 8, 2015: ( pdf ). 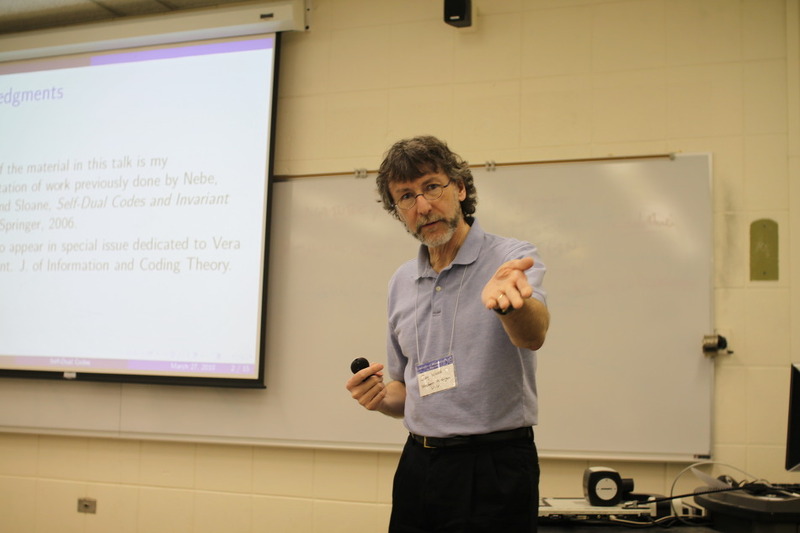 MacWilliams extension theorem and converse, June 9, 2015: ( pdf ). MacWilliams extension theorem for other weights, June 9, 2015: ( pdf ). Isometries of additive codes, June 10, 2015: ( pdf ). One-weight and relative one-weight codes, June 10, 2015: ( pdf ). 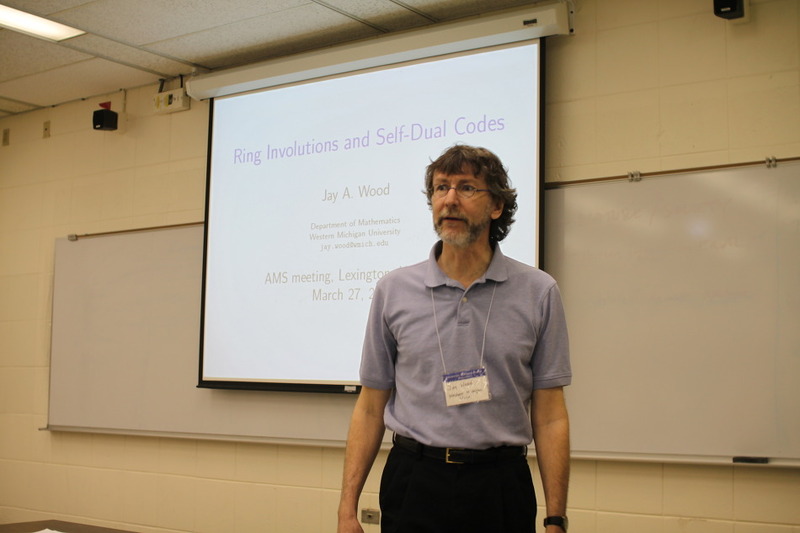 Self-duality for linear codes over modules, June 11, 2015: ( pdf ). Simplicial complexes coming from linear codes, June 11, 2015: ( pdf ). Mini-course, Foundational aspects of linear codes, for the workshop On the Algebraic and Geometric Classifications of Projective Varieties, Messina, Sicily, June 20-24, 2016. Characters and Frobenius rings: ( pdf ). Fourier transform and good duality: ( pdf ). Extension property: sufficient conditions: ( pdf ). Extension property: necessary conditions: ( pdf ). Research seminar, Isometry groups of additive codes: ( pdf ). Lecture series (course), Character-theoretic tools for studying linear codes over rings and modules, for the CIMPA research school Algebraic Methods in Coding Theory, Ubatuba, Brazil, July 2017. Linear Codes over Finite Fields, July 3, 2017: ( pdf ). Additive Codes and Characters, July 4: ( pdf ). Duality for linear codes, July 5: ( pdf ). Self-duality for linear codes over modules, July 6: ( pdf ). MacWilliams extension theorem and converse, July 10: ( pdf ). MacWilliams extension theorem for other weights, July 11: ( pdf ). Isometries of additive codes, July 12: ( pdf ). Using semi-group rings, July 13: ( pdf ). Extension Problem for general weights, July 14: ( pdf ). The extension theorem for Lee weight using Dirichlet L-functions. Slides for my talk in the Algebra Seminar, Department of Mathematics, University of Sao Paulo, Sao Paulo, Brazil, July 17, 2017: ( pdf ). Groups of isometries of additive codes over GF(q). Slides for my talk in the special session on Finite Algebraic Combinatorics and Applications, Mathematical Congress of the Americas, Montreal, Quebec, Canada, July 28, 2017: ( pdf ). Lecture series (course), Foundational results on linear codes over rings and modules, for the academic event "Some Topics in Algebraic Geometry and Linear Codes" sponsored by the Institute of Physics and Mathematics of the University of Michoacan, Morelia, March 5--9, 2018. 1. Codes and their duals, March 5: ( pdf ). 2. Additive codes and their duals, March 6: ( pdf ). 3. Linear codes and their duals, March 7: ( pdf ). 4. The extension problem for Hamming weight, March 8: ( pdf ). Research seminar, The extension theorem for Lee and Euclidean weights, March 9: ( pdf ). Lecture series, Linear Codes over Finite Rings and Modules, Central China Normal University, May 2018. Lecture 1: Linear codes over finite fields ( pdf ). 2: Representations and characters ( pdf ). 3: Fourier transform and MacWilliams identities ( pdf ). 4: Generating characters and finite Frobenius rings ( pdf ). 5: Self-duality for linear codes over modules ( pdf ). 6: MacWilliams extension theorem ( pdf ). 7. Converse of the MacWilliams extension theorem ( pdf ). 8. MacWilliams extension theorem for other weights ( pdf ). 9. Extension theorem for Lee and Euclidean weights ( pdf ). 10. Using monoid algebras ( pdf ). Additional research lectures: 1. Isometry groups of additive codes over finite fields ( pdf ). 2. The extension problem for general weights ( pdf ). 3. Simplicial complexes arising from linear codes ( pdf ).